View important policies and frequently asked questions for our Training program below + check out our New Student Guide and an overview of our Beginner and Intermediate level classes. Please contact Senior Training Manager, Jessie Kardos, at jessiek@gibneydance.org with questions. I'm a new student, what do I do? Create a Mind Body account to begin purchasing classes online. Arrive early before your first class to complete registration and receive your Gibney membership card. Sign in to class, purchase class credits, and dance! Download our New Student Guide here. What styles of dance do you offer? 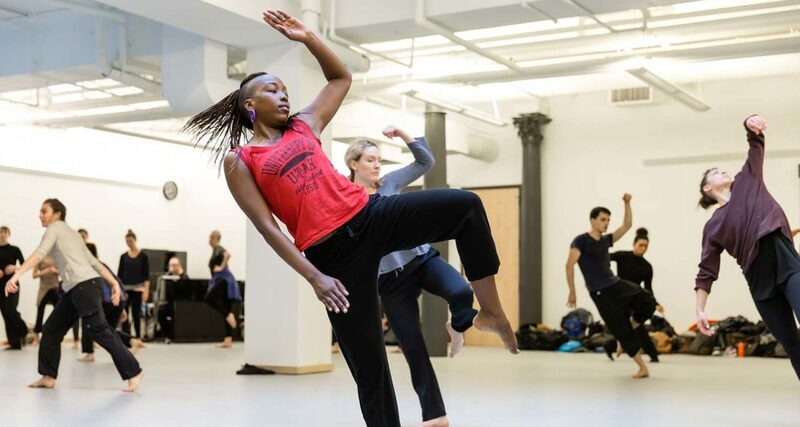 Gibney offers a diverse roster of classes with styles including Ballet, Contemporary Dance, Simonson Technique, Floor Barre, Pilates, West African, Gaga, Hip Hop, and more. View the current class schedule here. Do you offer any beginning or intermediate level classes? Yes! There are beginning, intermediate, and open level options available seven days a week. Download our guide to Beginning & Intermediate Level Classes. If an injury has prevented you from using a class series, please contact us with proof of injury to be considered for an exception. Classes occur at one of the two Gibney locations: our Lower Manhattan location at 280 Broadway (entrance at 53A Chambers Street) or our Union Square location at 890 Broadway on the 5th Floor. In both locations, all students must sign in downstairs with the security or building staff before proceeding upstairs. Classes occur in various studios. Students can view studio locations posted at the Class Registration desk and outside each studio. All ballet and other classes at 890 Broadway take place in Studio 5-2. Occasionally, classes may move studios for special circumstances. Please visit the Center Office near the elevator if you cannot find the studio. All guests must sign in with their full name before entering Gibney’s spaces at 280 Broadway and 890 Broadway, and ID may be requested at the discretion of building security. Compliance with this policy ensures that our spaces are safe and secure for all visitors. If for any reason you are unable to sign in or present ID, contact elyse@gibneydance.org. The 890 Broadway building requires guests to present photo ID upon every sign-in in order to be granted access to the building. This is a building-wide policy, not a policy of Gibney. Acceptable forms of ID include: driver’s license, passport, school ID, voter registration card, green card, state ID card. If you or any of your guests do not own or are unable to present any of the previously listed forms of identification, please contact our Operations Manager Ali Herring at alih@gibneydance.org. All students must register and complete payment prior to class. Students may register in person at the front desk on the second floor at 280 Broadway, or online using our website or the MindBody Online app. Students may only register in person for Access8: $8 classes. Upon first time registration, new students will receive a Gibney class membership card. Each time they attend class, students must present their membership card to sign in and pay for class. There is a $5 replacement fee for a new membership card. Students may pay for class with cash, check, credit/debit cards, or class series via their membership card. Please make checks payable to Gina Gibney Dance, Inc.
For The Playground classes, students must pay $10 in cash for their first class to receive a special Playground membership card, which is presented upon future visits to receive the $5 class price for Playground classes. If they fail to bring their Playground card, they will not receive the $5 price. The Playground classes purchased in person must be paid for in cash only. Online Playground registration is available, paid with credit/debit card, for $6. Students taking Zena-Rommett Floor Barre® at 890 or Sati classes should pay the teacher directly. In-person registration occurs 10-15 minutes before class at the front desk with your Gibney membership card. It is mandatory that you sign in and pay at the desk before going into a class studio unless you have pre-registered. If you have pre-registered online, you may go directly into the class studio without stopping at the front desk. For Zena-Rommett Floor Barre & Sati classes at 890 Broadway, registration occurs in person in the studio at the beginning of class. You do not need to check in at the Class Registration desk. Since all classes are drop-in, pre-registration is not available. Zena-Rommett Floor Barre classes at 280 Broadway require registration 10-15 minutes before class at the Class Registration desk with your Gibney membership card, or preregistration online. How do I Pre-Register for Class? You may reserve your place in class by pre-registering on the Gibney website or the MindBody Online app. Students may also purchase single class, Movement Research class credits, 5 class series, 10 class series, and Playground Online Registration credits via the website. Pre-register at GibneyDance.org/ClassSchedule. Pre-registrations may be canceled up to the class start time. Should you be unable to attend a class you have pre-registered for, you may contact the front desk via phone prior to class to cancel your registration. Pre-registrations cannot be canceled after the class start time and you will be charged for the class. Please be advised that if you pre-register for a class with an incorrect credit, you will be required to purchase the correct credit prior to entering class. Partial payments will not be accepted at any time; we are happy to refund the incorrect credit. In person registrations may be canceled up to the class start time, but cannot be canceled after 15 minutes past the class start time. Pre-registrations cannot be canceled after the class start time and you will be charged for the class. If Gibney cancels the class, credit will be automatically applied to your account. If a non-series credit was used for a canceled class, and you would prefer a refund, please let our front desk staff know. The Training Program staff evaluates refund requests on a case-by-case basis. Gibney is not able to process any partial refunds, including partially used class-series. Students may only receive a refund in the form of original payment. Can I purchase classes as a gift for a friend? Yes, gift cards are available for purchase. Inquire at the front desk for more information. Note that class credits purchased as a gift card will begin expiring once redeemed by the recipient. The main entrance for Gibney 890 Broadway is an accessible entrance and available during all building hours: 7:30 am – 7:30 pm Monday – Friday, and 9:00 am – 6:30 pm on Saturdays. Requests for reasonable accommodation or for access to the 890 Broadway location outside of listed hours should be made three days in advance by contacting Ali Herring at alih@gibneydance.org or 212.677.8560 (Voice only).